Direct from our Scary Monsters cover artist to you: All New Volume 2! 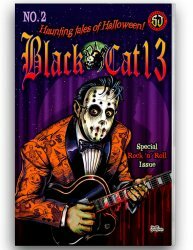 Black Cat 13 Tales of Halloween #2 Rock N Roll Special with Bonus Nightmare City Halloween CD! Black Cat 13 returns for this all new 2nd offering of Halloween Treats from the team that brought you "Heavy Metal Monsters" and "Rock 'n" Roll comics" comes this all new collection of art and stories by Scott Jackson (Rock 'n" Roll Comics), Dennis Worden (Stickboy), Brad Moore (Bathory), Ralph Reese (Creepy, House of Mystery), Eric Pigors (Toxic Toons), Lyndal Ferguson (Dr. Bang) and many more! Join us again for a roller coaster Halloween hay-ride mixing classic '50s precode horror comics, '70s psychedelic underground comics styles, and more for a variety of spooky art and stories with a rock n roll twist. Guaranteed to satisfy your Samhain sweet tooth! PAPERBACK EDITION: 38 pages printed in glorious Haunt-O-Rama (Black & Orange). BONUS: FREE Halloween music CD Nightmare City Halloween radio show special mixed by Stevo in Yr Stereo. More than 60 minutes of music and sounds of a truly haunting nature. Official companion to the Black Cat 13 #2 comic for the ultimate Halloween Experience! Black cat 13 is a trademark of the Scott Jackson Studio. Art & Music compilation Copyright 2005-2018 Scott Jackson Comic Works. All rights reserved. Ordering Instructions: You must select shipping destination from drop down menu above. All orders ship within 3-5 business days. We also still have copies of Black Cat 13 available ... also with a free bonus CD!